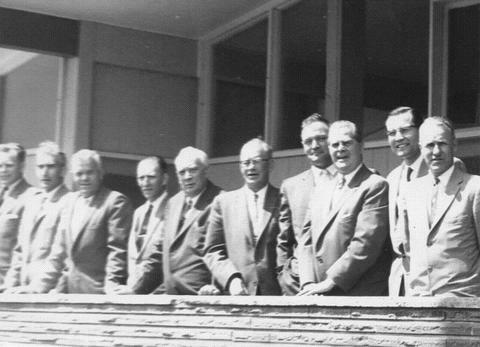 The Cabinet of British Columbia met in Squamish on June 23, 1960. Left to right: Honourable L.R. Peterson, Minister of Education; Honourable W.K. Kiernan, Minister of Mines and Petroleum Development; S.R. Bishop, Chairman of the Village Council; Ed Antosh, Commissioner; Honourable N.P. Steacy, Minister of Agriculture; Honourable E.C.F. Martin, Minister of Health Services & Hospital Insurance; Don Robinson, MLA (SC Lillooet); Honourable W.A.C. Bennett, Premier; President of Council, Minister of Finance; L.C. Kindree, Commissioner; Honourable Lyle Wicks, Minister of Labour.